Turtle Moon Studios. Susan Shie. Turtle Trax 1-6-99. Happy New Year, for the Very Last Year of the Millennium!~~¡Ole! Above, Hattie Clementine Spooler admires our sweet and faithful old scarecrow, Ruth Stout, who oversees the winter garden in the January snow. We have a Turtle Art Camp here, starting today, Jan 6-12. Once Camp starts, we'll be very focused on that, so it was really important to get this entry out NOW! My Irish penpal, Bridget O'Connell, aka Pearl to me, reminded me that today is Epiphany, which is when the Magi saw Jesus and realized he was the Christ. Far out and solid! I think my personal epiphany is that the ratty ice, left by a major ice storm a few days ago, is melting today! What a relief, to have the temp come up to normal January standards. 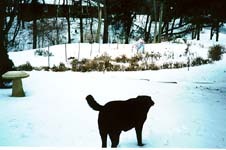 Hey, we don't mind sonw, which we are getting more of, but that ice stuff isn't funny. We only had about 5" of snow, when the big rain and then ice hit! Ick! Pooey! At least we never lost our electric, as some places did. Jimmy is feeding the wild birds and squirrels and whatever else shows up, including the flock of wild turkeys, who have taken up residence in our nabe! So let's talk about those wild and grizzly holidays before Twelvth Night (Epiphany.) Let's start with Christmas. Here's our treetop UFO, nestled in amongst the lights! We bought our tree from a friend, who grows them to sell. We like to chop, and I think it's the best part of the whole shabang, going out, wandering around, and selecting the tree. Jimmy saws, while I hold the tree and lean it away from the cut. Then we carry it back to the Trooper, stuff it in, bungycord the rear door shut, and home we go! The whole casa smells so good, when the tree goes up! Cats adore it. Out come the light strands, the ornaments we've collected since Gretchen was a little girl, and the stockings. Jimmy got himself a new tree stand this year. I think it's called the Pivot Point. I didn't use it, but apparently you stick the tree in, step on a pedal, and a bear traplike device grabs your tree trunk by the throat, and it will never, ever fall over, no matter how many cats you have climbing that sucker! The old stand, one of those big round plastic things that looks like a UFO, and holds a ton of water, will now become a new spaceship for Commander Willy, our cat who begs for rides in clothes baskets, even being swung upside down, by his Ground Control Coordinator, Jimmy. The tree is gone again now. Yea! Space to move around again! I am really a Christmas humbug of the first degree. I prefer funky holidays like Mardi Gras and Chinese New Year, which come together, on the 16th of Feb this year, on the Aquarian New Moon. I will be beside myself with rapture! The Chinese year is the yellow, or golden, rabbit. The earth rabbit, that is. We are just ending the yellow tiger. Rabbit years are supposed to be quiet and peaceful, after we rauccus tigers are done with you! So maybe Clinton will even get a quiet year, and our tax money can go back to stuff like repairing bridges, building schools, doing disaster relief, and feeding the poor! Oops, was that a political tirade? Nah. Anyways, it's MY diary! We put a lot of time and thought into our Christmas creation: "Jimmy and Susi's Bootlegged Christmas '98." Jimmy made the master tape, alternating favorite tunes of his and mine. Then I made the photo collage you see above, for the cover, of us in front of the house, did the song list on the computer, and reproduced it 40 times, along with making 40 dupes of the tape. We liked it so much, we plan to do a new one next year! Our penpals in Ireland and Russia, along with friends all over the US, got stuck listening to our best loved music, 27 tunes with only two repeat artists. Old hippy stuff, y'know? Gretchen and Mike came home for Christmas. Here we see master computer genius (NOT) Jimmy, giving Mike some probably terrible advice on how to run our Macintosh. I shouldn't be so hard on Jimmy tho, as he is making a real stab at reading his fly fishing email list every day or two, and has sent a couple of email replies on his own now. I don't have the problem some women have, of a husband who loads up the hard drive with game software, or upgrades the wife's programs for her, crashing the whole system, but I do look forward to his being a bit more facile with email! If he would stick to his typing tutorial, it would help, but he gets mad when that little software tells him he's been a bad student, for going so long between lessons! By the way, did you know we Mac folks don't have the Y2K problem at all? We just keep on using our sweet little Macs, and they just sail on into the millennium! Have you seen the new Mac, that looks like a Jetsons' computer, even turquoise in color, so it matches the Fiesta Ware? Matilda here, she's just a plain girl, but with her 19" screen, she's a big mama! The better to see her with, my dear! Here are my sweet Gretchen and me, happily enjoying Christmas morning! She crochetted me the muffler scarf I have on here. Nothing makes a mom happier than when her daughter makes her a present with her own hands! I used to crochet and knit and sew clothes all the time! Gretchen said that while making the scarf, she ripped it out the first time, since she thought I would notice that it was too narrow and tightly done. Well, we all need to go through that ripping out process, and I used to think, even tho I was trashing a lot of work time, it was a thrill to rip out all those stitches! I ripped out a whole knitted dress once! We are talking eons ago, as I quit all that when I went into artmaking for a living. Sad to not have time to make family goodies tho. Can't do it all. Gretchen can crochet evenings, now and then, resting from her day in the office, at the museum. It's relaxing! Thank you, Sweetheart! The wildest present any of us got was Jimmy's fish slippers, rainbow trout, that Gretchen and I got him, shopping down to the wire on Christmas Eve, our favorite day to shop, when the adrenalin is surging!!! He said if we got them, he would actually wear them, and he does! We also surprised him with a pair of rainbow trout tube sox! He didn't know they had those! Apparently these are not just rolling off the store shelves, as both fabulous items were on sale, before Christmas! Ha! These fly fishermen tho, there's no telling what they'll do! I bet if they made trout thongs, they'd wear 'em! Well, OK, not Jimmy, but he'd buy them as a get-over gift for his fish buddies! He says the trout slippers are really comfy! Why is this mircowave sitting out for the trash? On Christmas morning, the first thing I did, as usual, was to make my hot water for my vinegar and honey tonic. But the microwave made a funny noise and didn't heat the water. Soon a suspicious, funky smell told me our wonderful 16 year old GE microwave had bitten the dust! Wah! I bought it used in Jan, 1985 for $150. So you see, we got our moeny's worth! It was a huge rascal with knobs to turn, instead of digital stuff. It was really easy to use. No turntable back in the Stone Age, but we liked it just fine. Now it was deader than a door nail, and we had to go shopping for an unexpected Christmas present! Many times in the interlude between microwaves, we were presented with problematic cooking situations, and it was clear that the microwave oven is an active part of our kitchen habits! We went in search of another huge mircowave after Gretchen and Mike went home. We comparison shopped at three stores, all in one little plaza clump, and spent our jackpot wad right here in good ole Wooster! Ended up with a new huge and powerful Panasonic thing that speaks in three choices of languages, for less than the used GE had cost, only $129!!!! This penchant for bargains on any kind of major purchase is deep rooted in Shies. You should see me buy a car or house. The sellers don't have a chance. I think of myself as a poker player, during these adventures. It is a favorite sport! Whole family's like that! Gotta walk away at least once and leave 'em high and dry. I even did that in buying the microwave, but went back unasked, when I had to admit that this was rock bottom price! Still, it was fun walking out! Poor Jimmy! Married to a wheeler dealer! We are now enjoying our fancy new oven, with more options than you can shake a stick at! But, like a good camera, you can use very simple options or get very sophistocated. It even has a button for frozen pizza, and when you press it, it asks you to tell it how many servings! And that can be in English, Spanish, or French. Guess Germans, Chinese, and Russians are fresh outta luck! Or maybe there's a market where those are the three language options. Are the choices Arabic, Hebrew, and various African languages in the Middle East??? Maybe your microwave has had these fancy features for many years. But we are simple folk from Planet X, where cooking is still done on 1920's gas ranges.....OK, that's a lie. We bought a stove when we moved here, and it has the fancy Euro burners, like flat frying pans. Oh, we named this microwave oven Panny, in honor of my mother, whom the grandkids all call Panny. Dad is PaPaw. I know, you have those funky grandparent names in your family, too. Might be fun to sit around and name each other strange grandparent names! Some of us went to see Mom and Dad for Christmas. 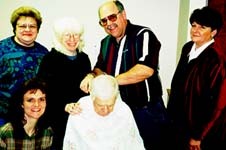 Here is my brother Larry, giving Dad a haircut, with Donna, Nancy in front of her, me, and Sherry, all giving advice. Backseat haircutters! Larry is the official family barber, and used to come over and give Dad haircuts, when Dad lived here. It was great, since we sibs don't see each other as much as we'd like. Sherry would come, and they'd bring their dog, Duncan. Now they have about six dogs! As bad as us, with our five cats and Hattie! Dad loves it when Larry cuts his hair. He was really happy that we all came at once. It is so hard to see Mom sitting there, unaware of what's going on, and yet, I still think on a deeper level, she knows as much as we do, on a soul level.Yesterday, when I was at the Home, she started giving me Pig Kisses, where you blow on someone's skin, instead of kissing. She did it over and over. I have to admit, I started it, last week, and wonder how she absorbed that, and carried it over to this week. See, she's very sly! We both worked really hard on this piece, which I frankly thought would not have enough work time to make it a really major piece. But at some point, I think when I beaded and sequined the 16 pink fish, I knew it was worth going over deadline, and pulling many late nights, to get the job done as well as we could! 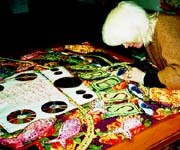 Above, I am attaching the 3-D forms to the quilt. This piece makes me happy, because it is loaded with stuffed forms, like in my early art quilt days, and yet, has a lot of beadwork and detail sewing. So here it is, finished two days ago, except it still needs its casing and label on back. Just did the fancy photography, tho this shot was from the point and shoot Olympus Stylus, which I also love. The "serious" slides and photos are done with a Minolta Maxxim. Most of the pix you see on this site are from the Olympus, except for most of the art shots, done with the Maxxim. 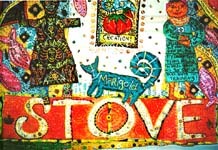 Anyhow, this quilt is called "The Stove/Empress: Card #3 of The Kitchen Tarot." It's 74" high and 48" wide. Weighs a ton. In regular Tarot, the Empress is the Earth Mother, so I figure in the kitchen, the stove is the quintessential equivalent! Ruled by Venus, covering both Libra and Taurus, she is the Goddess. Mama's cookin'!!! I'll be making Kitchen Tarot cards of it soon! 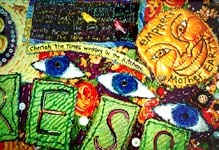 Here's a detail shot of the top right corner of the quilt. All the sewing is by hand here, and all the forms are stuffed and quilted/embroidered/embellished, before being added to the background quilt. Most of the writing is diary jabbering by me, as usual. And here's a close-up of the bottom of the quilt.You can see St. Quilta the Comforter, as a doll, on the right, in her aqua muu-muu of Lunn Fabrics, which many of the fabrics are. (not the goony flowery top background or the patchwork of the bottom background, tho.) Marigold is in the center here, with a huge spiralling tail. And above her is the original pincushion painting that started the whole challenge! It's a giant pocket here, and visually is the window in the oven door. I was painting tomato pincushions way before St. Quilta came to me in a rapture, in Oct, 97, but now they do symbolize St Q, since she can spontaneously manifest (appear) wherever a tomato pincushion is sitting around! Did I mention that the background quilt is the flipped over and sideways start of the Dishtowel Quilt, which has to be restarted now? Ripping off our own quilts!!!!! Ai yi yi! Are you wondering why the many pink fish are swimming around the stove? 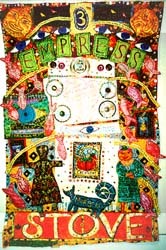 The fish is a symbol of fertility in China, and the Empress/Earth Mother is also a fertility symbol. So there you are. Besides, it's fun to do fish, and can certainly symbolize my Jimmy's fish obsession. Had I mentioned that he doesn't like to eat fish? Always lets 'em go! And then, before the quilt was done, we had Debra Lunn and Michael Mrowka, from Lunn Fabrics, up as honored New Year's Eve guests! What fun to watch four episodes of South Park, while waiting for the year to change over! Here are Debra and Mike, watching the big 500 lb. aluminum ball drop at Time Square! Next year, instead, we get a Waterford crystal ball, specially made for the millennium! Guess what that thing will weigh!!!! Yikes! 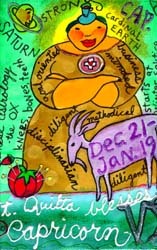 Here is "St. Quilta Blesses Capricorn," the painting, and soon, the laminated saintcard. There is only this one image to show you, until about Jan 12, when I get my photos made and developed of all of the nine paintings for sale. Go see these on the paintings page, to read about this and the whole planned series of St. Q astrology blessings. Sagittarius is the only other one made so far, and Aquarius will be next. This image is cut off on both sides, since I scanned a whole painting, rather than a photo of one, for now. The paintings sell for $100. each, at a 13.5" x 9.5" size on unstretched fabric. If I quilt them, they're $500. each. So, the camp is beginning, and I gotta go make art with three brave souls, who came in spite of Winter and all our weirdnesses! We will have a second Full Moon this month, on the 31st, and that's a Blue Moon. And the same in March, a phenomenon that hasn't happened since 1915, the year my dad was born! Jan 31, we'll be finishing up our classes at Leslie Gelber's symposium in Sacramento! Expect the next Turtle Trax entry around Feb 9. Just have lots of big deadlines between now and then! Like getting "Lucky Stars" made, the astrology primer. It'll get done! Meanwhile, here's Hattie, clutching one of her stuffed toys, Baby Bunny, waiting for your visit to Turtle Moon! Adios!